You don’t have to look too long or too hard to realize that the tech sector is in the midst of a fast paced, ongoing evolution. This period of rapid change has slowly been gaining momentum over the last few decades and seems to speed up with each successive year. 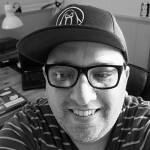 The effects are far reaching as advances in computing, robotics, manufacturing, hardware, and software redefine our traditional, analog processes and thrust society into the next era of connectedness and productivity. As we move forward year-by-year, we are introduced to new futuristic terms and concepts like IoT, VR, and autonomous vehicles. These new industries are set to refine our perception of daily life, while revolutionizing the industries they touch. As we move further into connected space, our economy is also slowly on the move. Many have talked about the benefits of a true “digital economy” and the what that could bring. But are we there yet? The advancement of the tech sector and the switch to the digital space is of great concern as we peer into a future that many of us just struggle to keep up with each day. Douglas Rushkoff, however, is not one of those individuals. 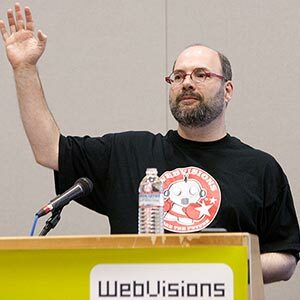 He has made a career of peering into that unknown future and helping the rest of us come to grips with the burgeoning digital space. His books have tackled a wide variety of topics dealing with this period of change, its effects, and warning signs that things might not be progressing as smoothly as they could be. We convinced Douglas to take a few minutes to answer some of the questions we have about the economy, a new renaissance, and where things are going right and wrong. Each transformative period is a moment to remember that we are programming our reality to favor the best things about humanity. Much has been said about the “digital economy” and its role on the consumer’s life. How would you describe the current state of that economy? Are we there yet? Honestly, I don’t think we’re in a digital economy, yet. We’re really just in an amped-up version of the old industrial economy: traditional, extractive, mass-scale corporate capitalism, where the object of the game is to monopolize value creation and promote the growth of capital. In other words, it’s the same old economy on digital steroids. The true digital economy is in the most fledgling state, a great majority of business – digital and otherwise – is geared more toward thwarting these early efforts. The true digital economy is emerging in the form of platform cooperatives (digital companies actually owned by the participants), crowd-funding, and peer-to-peer transactions directly between people. The way to distinguish truly digital spirited economic activity is to see whether it is distributing value, or just extracting it. 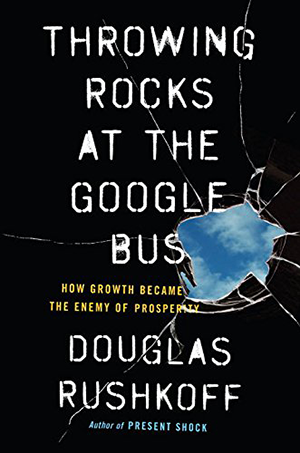 Your new book, Throwing Rocks at the Google Bus, examines your thoughts around the digital economy and how you believe it’s currently on the wrong track. What, in your opinion, have been the biggest mis-steps in the development of this digital transaction space? I guess the biggest mis-step is for innovators to focus on “disrupting” one small sector, without ever questioning the underlying business processes. So they may develop a technology that disrupts music or journalism, but then they run to a venture fund or Goldman Sachs to get on the track to be acquired or having an IPO. So the problem is that everyone is keen on creating new operating systems for one thing or another, but no one is questioning the bigger operating system on which all of this is occurring: capitalism. Now capitalism itself isn’t so bad – as long as investors realize that there are factors of production that must be valued other than the capital. Traditionally, as long as there has been economics, we’ve recognized the factors of production to be land, labor and capital. All three are required to make business work. But capital – money – is the only one of those factors that can be digitized and scale up. And so it’s the only contribution that gets valued. The people putting in the money end up the only ones who own a piece of the pie. As a follow up to that question, of those mis-steps, which do you think are the easiest to change in order to right the ship? And even more to the point, can it be righted? The easiest path to a fix is to recognize that there are more stakeholders than the investors. You could start with the workers. Let the people using a platform be its owners. Distribute just 10% of Uber’s shares to the drivers. That would be the first step toward adopting a business model that seeks to create wealth rather than simply extract it. There has been a lot of talk about industry 4.0, hyper-local manufacturing, and bringing the means of production back to the individual. 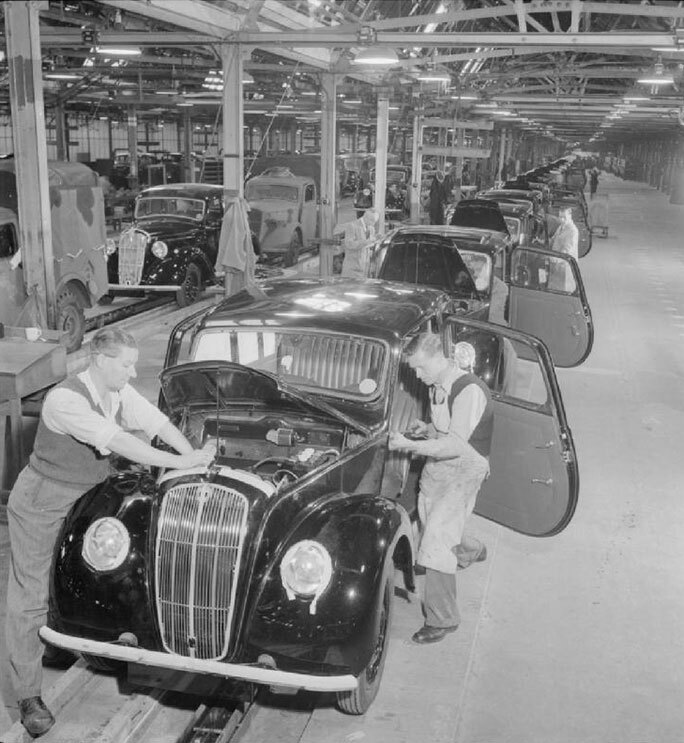 What do you see as the largest benefits from putting these types of manufacturing processes back in the hands of individuals, rather than large corporations? Well, most simply, it retrieves a concept first articulated by the Catholic church when it was trying to state its position on Marx and runaway industrialism. The popes argued for a principle they called subsidiarity, in which no business grows larger than it needs to be in order to serve its purpose. Growth for growth’s sake was seen as the problem. They also believed in what was later called “distributism” – the idea that workers should own the tools through which they create value. So at the time, that meant the land on which they worked, or the machines they used to make stuff. If they were co-owners, then they couldn’t really be exploited. It was their company, their land they were contributing to. In digital terms, this means the net being able to foster value creation by people on the periphery – not just by workers who travel to the city to work in somebody else’s factory. A new industrial age could bring around great transformative change. Do you think we are on the threshold of, or are we in the midst of a period of growth–a new renaissance? My whole point is that the new renaissance is not a period of growth. We transcend the whole idea of growth (grow what? the economy? at whose expense? the planet’s?). And instead, we learn how to prosper in a more circulatory, “steady state” economy. The objective is not to grow businesses by lending money and then extracting it from the economy. 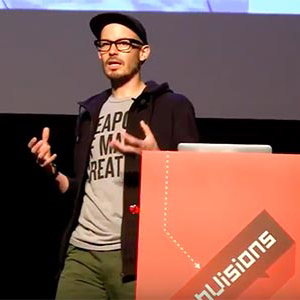 We don’t optimize for growth, but for circulation. We get money moving throughout the economy. We encourage lots of translation and value exchange. We keep recycling the same money. Instead of “capturing” value and turning it into dead shares of stock, we keep all that value circulating through the economy. Growth is really a trap. Are there practices from the tech industry that economists can utilize to develop more equity in the business world? Something akin to “Open Source Economics” versus the winner take all model? I don’t know if the economists can do it, but the entrepreneurs and investors and technologists can. All the economists can do is make the suggestions and show the proofs. But yeah, I suppose the principles to understand are, first, the distributed nature of networks. Everything is accessible everywhere. They need to think of money that way – not as something programmed to accumulate, but something programmed to move in a frictionless way throughout the network. Second, on the level of legal reform, they can stop taxing dividends more then capital gains. That means they have to stop punishing real earnings, and rewarding the passive accumulation of income by not taxing it as much. They should think of the economy less like a hard drive, and more like the cloud. Finally, they can look at the open web – the peer-to-peer alternatives to fat platforms that seek to monopolize our interactions. People can actually interact in a peer-to-peer fashion online, without the need for a central authority or arbiter. They can transact this way, as well. What do you see as the main value(s) that should/could come from a transformative period of great change? The main value should always be the value of humans. Each transformative period is a moment to remember that we are programming our reality to favor the best things about humanity. Too often, we use these transformative periods to deny our humanity or, worse, surrender it to some other ideal – whether it’s the pyramids, the factories, or – today – economic growth. Whenever we are in transition, as we are now, we have the ability to see those faulty programs and rewrite them to express our deeper purpose. But to do that, we have to get back in touch with our humanity. And that’s hard when our behaviors are so driven by software. In one of your recent lectures at The New School you talked about the initial purposes of the industrial age, one of which was to remove peer-to-peer transaction. Do you see that reversing and what would be the overall benefits of it? I see almost everything about the industrial age being reversed by the things being “retrieved” by the digital age. A renaissance means old, repressed ideas being reborn (re-naissance) in a new context. So industrialism really came out of the last renaissance, which was largely about rebirthing the ideas of ancient Greece and Rome: centralization of authority, empire, and expansion. Today’s renaissance would retrieve the medieval values (not the lifestyle!) that were stamped out by the renaissance: crafts, peer-to-peer trading at the market, local value creation…even craft beers! Really, it’s no coincidence that the cultural expressions of the digital age – like Burning Man and etsy – share so many medieval qualities. The benefits of reversing the dehumanizing bias of the industrial age – the drive to reduce human involvement and intervention in production and expansion – is to put the economy and technology back in the service of human beings, instead of letting them continue to devalue us. Because today’s technologies are so much more powerful than they were in the era of the steam engine. If we program them to remove human interference, this time they may be able to do it. 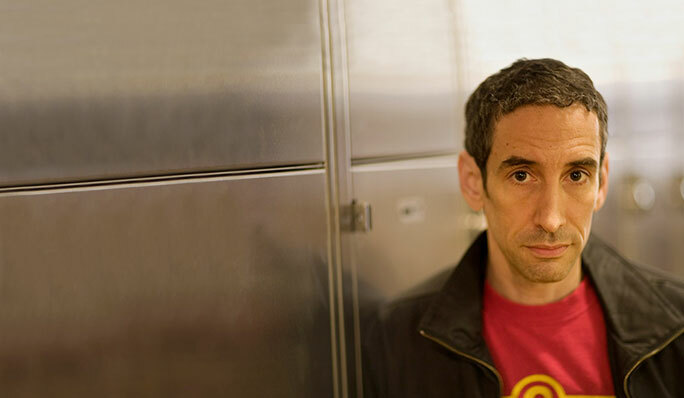 Dr. Douglas Rushkoff is an author, teacher, and documentarian who focuses on the ways people, cultures, and institutions create, share, and influence each other’s values. 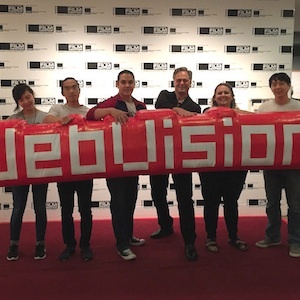 Douglas will be speaking at WebVisions New York and Portland on the subjects of media, society, and change in his talk, Throwing Rocks at the Google Bus – How Growth Became the Enemy of Prosperity.